Food Friday – Deep fried yumminess and Green custard! This past week I discovered my new favourite dessert. (It’s commonly eaten for breakfast too). It looks slightly unappealing but turns out to be utterly delicious. At our local night market there is always a queue by the stall selling these, which was my main reason for venturing to try some. 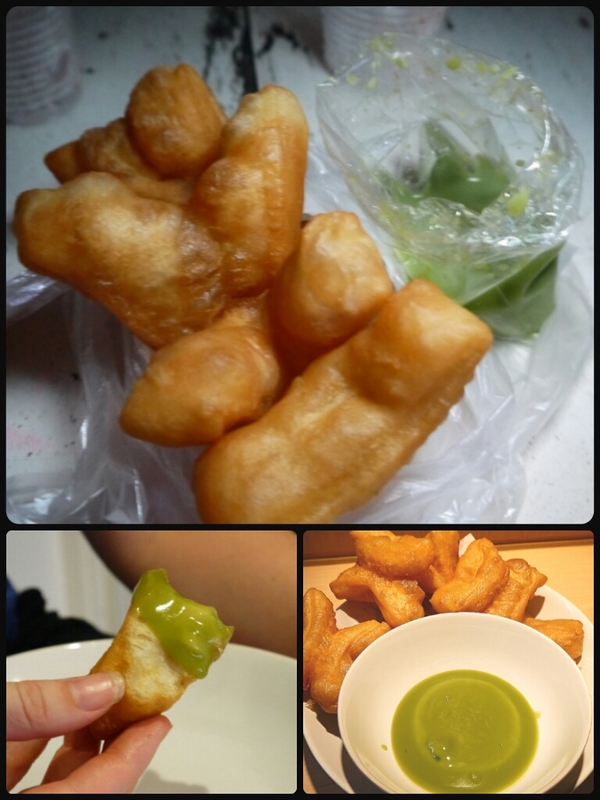 They are deep fried donuts (called Patongo in Thai) and Pandan Custard (called sang-ka-yaa in Thai). They are incredibly cheap at 3 Baht per donut and the custard is about 5-10 Baht for a little bag. The donuts are like ordinary sugar and cinnamon donuts but more crispy on the outside and light and fluffy on the inside. The custard gets its green colour from the Pandan leaf and has a similar taste to vanilla, it’s sweet and creamy. Considering they are deep fried and probably contain a lot of sugar I’ll have to limit the number I have. I love these!! Took me ages to work out what they were, but I have a new resolution to try anything, and I was glad I did! That’s a great resolution, I felt that why after eating Kuay jab nam khon. Where can I get patongo if I’m staying in Pratunam area? Your best chance would be in an area with a lot of street-side food stalls. From Pratunam, I’d suggest heading west along Phetchaburi Road (just jump on any bus heading that direction on Phetchaburi) and get off when you see what looks like a street-side market area. From memory there are a couple of clusters of food stalls before you pass under the toll road. Not 100% sure if there is Patongo but here is a map of the area – http://goo.gl/maps/7LRZY. If you don’t have any luck I recently saw a Patong stall near Saphan Kwai BTS sadly the one at the On Nut night market is no longer there.